Stress and anxiety are often partly a result of your perspective, or how you tend to think about challenging situations you face. You can learn to regulate stress and anxiety by changing the way you think. This is because excess worry and stress often come from overestimating the danger in a situation. Thinking the feared event will be worse than it really is. Q: What’s the likelihood of this feared event actually happening? A: The odds of this plane (car) crashing on this particular flight (trip) are less than one in a million, so why waste time worrying? Q: If the feared event actually happens, how terrible will it really be? A: If I fail at this task, it will seem important today, but in the big picture it’s really not that important. In a year or two, this will probably be just a distant memory. A: If this person doesn’t like or respect me, it’s not the end of the world. No one is liked and respected by everyone. As these examples show, the thoughts you choose to focus on can lower the intensity of your worry and stress. I’ve survived many tough situations, and each one has made me tougher. I’ll get through this one and end up even stronger. Even though I’m not perfect, I still love and respect myself. Perfection is an unrealistic and unhealthy goal. There are many possible explanations for this symptom. I’ll get it checked out, but in the meantime, I won’t catastrophize about it. It’s normal to feel fear in this situation; I’ll just practice some relaxation techniques to stay a little calmer. Fear is just an emotion that will pass. Avoiding fearful situations will make my fears stronger, but facing my fears will eventually reduce their power over me. Shifting your perspective can also be helpful when you are faced with a seemingly overwhelming set of responsibilities. If you feel overburdened by responsibilities at work or at home, take some time to prioritize goals and consult with your supervisor or family members to set more realistic expectations. Also examine your goals to see which of them could be delegated to someone else. Is there anyone kind enough to help you out if you ask them? Can you afford to pay for help? If you just didn’t do something, would someone else step in and take care of it? In addition to prioritizing goals and delegating or eliminating some that are not essential, it’s also smart to manage stress by subdividing big goals into smaller ones. Breaking bigger goals into smaller steps can help you feel a sense of accomplishment as you complete each step. Making “to-do” lists can also help to organize and manage your responsibilities. There are several ways to better manage stress and anxiety. One of the most effective ways is to change your perspective, or the way you tend to think about situations. Be on the lookout for a tendency to catastrophize and practice talking to yourself in more realistic ways. Frequently, stress is the result of taking on more tasks than you have the time or other resources to accomplish. Stress management therefore requires careful examination and prioritization of goals. Goals towards the bottom of the priority list may need to be let go, delegated, or put on hold. Featured image credit: Home by Mysticsartdesign. CC0 public domain via Pixabay. Richard Wanlass, PhD, is a healthcare professional who has devoted his career to helping his clients make the same types of adaptations taught in this book. Since 1987, he has served as Chief of Psychological, Social and Vocational Services in the University of California, Davis, Medical Center's Department of Physical Medicine and Rehabilitation, where he also holds the title of Clinical Professor. 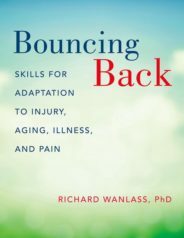 He is the author of Bouncing Back: Skills for Adaptation to Injury, Aging, Illness, and Pain. His blog post series on managing stress and anxiety can be found on the OUPblog. Interesting Article! That’s correct by changing our way of thinking will really make a big difference in order to face stress and anxiety.